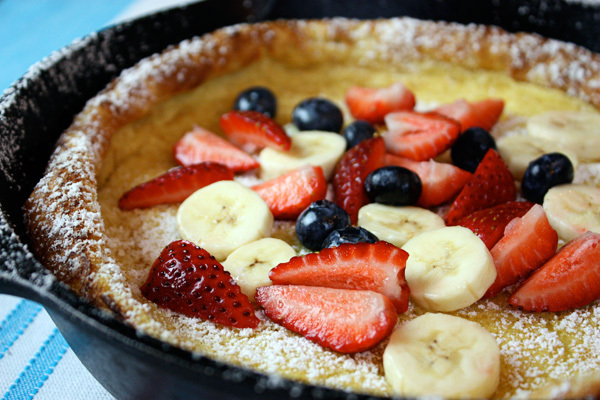 This dramatic pancake is a Sunday breakfast treat and a good way to add fresh fruit to your diet. You can fill the pancake with just about any fruit - strawberries, blueberries, peaches, raspberries, bananas, papaya, mango, pineapple, whatever is in season. Place a 10-inch cast iron skillet in the oven and preheat to 425° F for 30 minutes. In a medium bowl whisk together milk & eggs. Add flour, sugar, salt & nutmeg until blended & smooth. Carefully remove hot pan from oven and rub butter around the inside, then quickly add batter. Return immediately to oven and bake for about 15 minutes or until the edges are golden and poufy. Carefully slide the pancake onto a large serving plate, lifting the edges with a spatula. Dust with powdered sugar and add fruit. 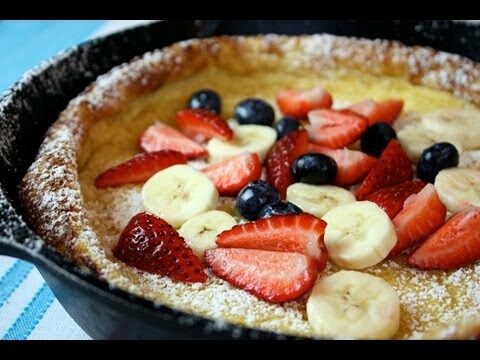 33 Comments on "Dutch Baby"
Very very good! My 60 year old iron skillet was a wedding gift & it is a 9”. I did not change the batter, but cooked it about 10 mins longer to be sure the inside was done. We ate it for an afternoon meal. I topped it with cinnamon seasoned, cooked chopped Honey Crisp Apples 🍎 and sprinkled with powdered sugar. I have a recipe similar to this and call it Volcano Pancake….I usually sauté fresh plums with a little brown sugar and cinnamon for the topping. A yummy treat! Is that a whole stick of butter just to grease pan? No. Please watch the video. Can I reduce the amount of eggs? I don’t know. I have only made it with 3 eggs. What brand of cast iron skillet do u use? I have not been able to find c a good name brand. Thanks. Got to try your dutch baby…looks so yummy. I have a Lodge cast iron skillet, which is the most commonly used brand. Wondering if you have experimented with Almond or Coconut flour combinations to improve protein content (and decrease carbs)? I have not so far but if you try any of my recipes with alternate flours, can you please report back and share the results? Thank you. I have but only like a mixture of the two or I split recipe 3 ways with organic all purpose , coconut flour and almond. I have a protien pancake recipe I love which helped me lose weight. I can share who ever wants. Laurie, please share your recipe!!! 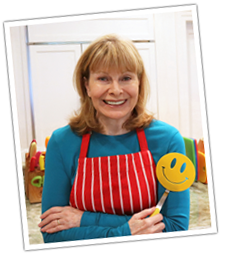 Hi Jenny, I love this site and have enjoyed several recipes, but I just tried this and it came out flat! 🙁 I wonder if my oven didn’t get hot enough?! How crucial is the oven temp? With a cast iron recipe like this, oven temperature is very important. I preheat mine (oven AND pan) for a good 30 minutes. If you preheated both for that long, it could be that your oven temperature is off and you can only determine that with an oven thermometer. You should know that only the edges puff up with this pancake and the center will be fairly flat. Thanks Jenny! I used to make this for my son but the recipe I had used way too much butter. I will make this when he comes home this weekend. Way healthier! Another option is sauteing sliced apples to put on top instead of fresh fruit. Yummy as well! Hi! I would love to try this recipe. Can I use Whole wheat pastry flour in place of the APF? Thank you! I made this a little earlier and it was so good. Hopefully am going to make another one tomorrow! Thanks for this recipe, the first time I made this I was excited. Another recipe i found was higher egg content and 3 Tbs of butter in the pan for even less batter than yours. I even wondered why so much butter was necessary when I was melting it but I figured better stick to the recipe since I’ve never made one before. Less butter is definitely much better! Thanks! I’m from Holland, and these pancakes are seriously delicious. I love your recipe. It was super delicious. I just squeezed some lemons on top of the powdered sugar and the Dutch Baby was perfect! Thanks for the recipe!